On August 18, 1881 Mamie, John, William and James Wilson, ages 12, 10, 7 and 6, were “rescued from a place called ‘Hell’s Kitchen,’” by Officer J. D. Frederick, as reported in the New-York Tribune two days later. The policeman had a warrant to remove the children from the care of a neighbor after both parents were sent to prison. Many of the ramshackle wooden buildings, as noted by the Tribune, were given names by the locals. Hell’s Kitchen where the Wilson children were found, would lend its name to the entire crime-ridden neighborhood from approximately 34th street to 59th, and Eighth Avenue to the Hudson River. Just a block south of the original “Hell’s Kitchen” building where the Wilson children had been was a similar structure at No. 508 West 38th Street. Three stories tall, it was faced in clapboard. 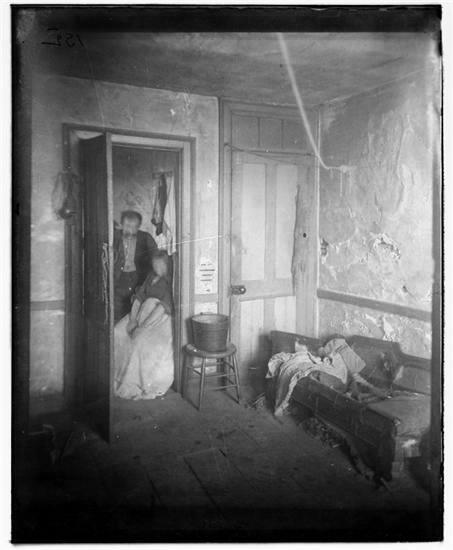 Scores of impoverished tenants crammed into its filthy rooms. The history of crime and violence at No. 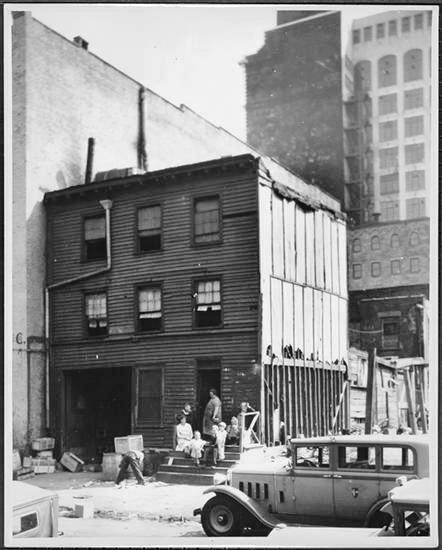 508 West 38th Street extended decades before the incident with the Wilson children. Poverty often went hand-in-hand with frustration, anger, crime and heavy drinking. Two of the tenants at No. 508 in 1868 were 55-year old John Corson, a coal cartman, and his wife Rebecca. Corson was crude, vicious and a heavy drinker. The Sun, who described him as “a thick-set and repulsive looking man,” on November 23, 1868 reported that he “was in the habit of beating his wife, and he was doing so on Saturday night.” This time, however, would be far worse than normal. Rebecca had suffered not only serious cuts and bruises, but her skull had been fractured. She died early in the morning the following day. Three months later Corson was still incarcerated in The Tombs awaiting his murder trial. Late on the hot summer night of August 23 1870 two tenants, James Keenan and August Boer got into an argument on the sidewalk outside the house. In true Hell’s Kitchen manner, it was settled with a knife. Keenan delivered a severe head wound to Boer who was given “surgical attention at the Station-house,” according to The New York Times. Keenan was arrested and Boer was able to return home to No. 508 West 38th Street. Blacksmith Peter White lived here in 1899 when a friend, Nathan Kronman, was arrested on charges of murdering his wife. When Kronman’s case was adjourned on August 11 for further investigation—meaning that the accused man would sit in The Tombs for an extended period—White came to his aid. With the help of fruit dealer William Young who lived three blocks away, he provided bail for Kronman’s release. While other Manhattan neighborhoods changed—improving or declining—over the decades; Hell’s Kitchen remained essentially the same. The dilapidated building at No. 508 West 38th Street remained the home of destitute tenants into the Depression years. And apparently the drinking habits of the occupants did not change, either. Early on the morning of February 22, 1932 Jacob Gredlinger opened up his small cigar making shop at No. 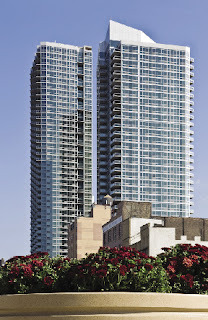 142 West 31st Street. To his shock and surprise the stove was already burning, fueled by his cigar boxes, and a man was slumped in a chair, a burned-out cigar hanging from his mouth. Like so many of the occupants of No. 508 over the past 80 years, McAvoy was arrested. He spent the next five days in the workhouse. The history of crime and poverty at No. 508 was drawing to a close, however. In 2007 the entire block where No. 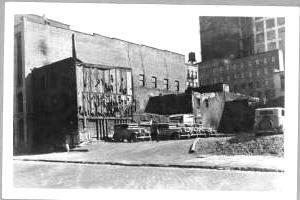 508 West 38th Street had stood was erased. 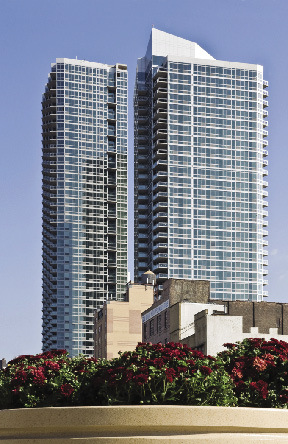 On the site, once part of Manhattan’s—if not America’s—most notorious district, rose the soaring luxury apartment complex named 505W37, designed by Handel Architects. Wonderful Art Nouveau brackets flank the building's name spelled out in jovial turn of the century typeface. For decades at the turn of the last century the three four-story brick houses at Nos. 154 through 158 West 18th Street had suffered a chilling tradition of death and illness. In the first years after the end of the Civil War they were operated as rooming houses. No. 154, in 1874, was noted by the Department of Health as having four cases of diphtheria—among the “largest number of cases” in the city. The block--lined mostly with stables--housed residents with only the most meager means. In 1899 Kate Freeley lived in that house. A servant, she disappeared that year after a man called at her room and offered her a position. The headless body of a woman found months later was assumed to be that of Kate. Three years later, in August, the body of 85-year old Annie Rockwell was found on the floor of her room. And in 1904 James Bell and his wife lived in two rooms at No. 154. In June the old woman became ill; but Bell had no money for a doctor. When she died, he could not afford to bury her. Unwilling to leave her body alone, he refused to leave his rooms to get food. A saloon operated from the first floor of No. 158 while rooms were rented in the floors above. All three houses were owned by Arthur J. Collins; and the seamy conditions here would come to an end when on May 26, 1905 he sold the properties to Charles Hellmuth. Schoeller ventured into an area rarely visited by Manhattan architects—that of Art Nouveau. While Paris exploded with the sensuous and—to some Victorian minds—startling curves and forms; Manhattan’s conventional minds seem to have disapproved. While a few architects, like Emery Roth, embraced the avant garde style; most avoided it altogether or cautiously dipped into its more restrained sub-styles. And so it was with the upper seven stories of the eight-floor Hellmuth Building at No. 154 West 18th Street, completed in 1907. The more-or-less commonplace factory building was faced in tan brick. Rusticated brick piers separated the vast openings, ornamented only by tepid capitals influenced by the Vienna Secession movement. But the ground floor base exploded with elaborate Art Nouveau ornament worthy of the Champs Elysees. The two entrances were crowned with elaborate cornices flanked by hefty brackets of swirling vines and lilies in full blossom—a popular Art Nouveau motif. Terra cotta panels announced the building’s name in fantastic Art Nouveau lettering. Acting as capitals, ornaments below the 8th floor cornice drew inspiration from the Vienna Seccesion movement. Designed to house printing firms (the top four floors were relegated as leased space), the interior ceilings were constructed of robust brick barrel vaults—capable of supporting the heavy presses and other machinery. The manufacture of printing inks required the use of highly flammable ingredients. To reduce the possibility of catastrophe, a heavy brick vault was constructed in the basement where the mixing of volatile chemicals would take place. In addition, a sprinkler system and automatic fire alarm was installed. In 1908 F. J. Emmerich & Co. added 8,500 square feet to its lease. Another early tenant was Henry E. Frankenberg & Co., makers of novelties. The firm employed 9 men and 20 women in 1913. A year earlier T. J. Hayes Printing Company had moved in with its staff of 27. It would remain in the building for decades. The firm marketed its product saying “It is a cream, not a paste. It does not melt or harden. It has no grit. It is not colored.” The consumer could purchase “a liberal tube” for 25 cents. On November 27, 1916 the unthinkable happened. A staggering 900 employees were at work in the building, “about half the number [were] women and girls,” according to The Evening World later that day. Early in the afternoon a Hellmuth employee named Shanz went to the basement vault to mix chemicals, the main ingredient being benzoil. Suddenly flames shot out and Shanz was burned about the head and face. Firefighters responded to the smoke-filled basement. As they fought the blaze, a vat of benzoil exploded, knocking the men to the floor and “painfully” burning them. Other firefighters dragged the men to street and fresh air. 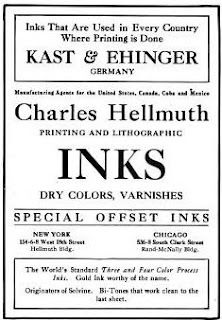 As was the case with most firms owned or run by German-born Americans when the U.S. entered World War I, the assets of the Charles Hellmuth company were confiscated by the United States Government in 1917. Deemed “alien property” by the Trading With The Enemy Act of 1917; the assets were eventually repurchased by Bernard Richmond Armour who had taken over the Hellmuth presidency in 1919. The T. J. Hayes Printing Company was still in the building when its founder died on August 27, 1925. Having arrived as an Irish immigrant boy around 1855, the elderly Timothy J. Hayes had amassed sizable personal wealth. The firm would continue to do business from the 18th Street location at least into the 1940s. In 1935 80-year old Louis Kessell was employed by Charles Hellmuth, Inc. as its paymaster. A veteran of the Franco-Prussian War of 1871, he was still a feisty old soldier at heart. At 5:00 on the afternoon of June 10, 1935 he was sitting in his small room on the ground floor. On his desk was a metal box containing about $1,000 in cash. Suddenly a “thug” rushed into the room, landed a blow on Kessell's head with a cloth-wrapped club, and grabbed the money box. The old man, knocked to the floor, took a second to recover. Then, according to The New York Times, he “rose to his feet, shook his head to clear it, grappled with the intruder, and began to pummel him.” The shocked thief had not anticipated a fight from the spirited octogenarian. “By the time help arrived the would-be robber had fled,” said the newspaper. “The $1,000 was saved, although scattered about the compartment during the tussle.” Louis Kessell’s injuries were a bump on the head. Stanley Gould would be less lucky two decades later. The 36-year old salesman, less than half Kessell’s age, worked for his family’s Gould Offset Printing Company here. On December 3, 1954 he entered the building’s elevator with $1,800 in cash, the firm’s payroll. Two men got in the cab at the same time. Gould was later found bound and gagged in the elevator car. The thieves escaped with the cash. In 1973 the Hellmuth firm, now known as Sleight & Hellmuth, left their headquarters of nearly 70 years. In 1988 the building was converted to 28 cooperative apartments featuring the wonderful scalloped ceilings originally intended to support printing machines. The ground floor has been only slightly altered; leaving the Art Nouveau brackets and panels-- rare and wonderful in Manhattan—as architectural eye candy. As Washington Square and the streets branching off it were developing in the 1830s, speculator William W. Berwick got in on the action. Starting out as a mason, by now he was a builder. In 1839 he completed two identical brick-faced Greek Revival homes at Nos. 15 and 17 Washington Place, just steps from the Square. The style was just gaining a foothold, pushing out the Federal style used for the Washington Square mansions begun just a few years earlier. Berwick’s new homes were accented with brownstone; found in the high stoops, the doorway surrounds including heavy entablatures and cornices, and the lintels and sills. William Berwick and his family took No. 17 for themselves; while he retained possession of No. 15 and leased it as additional income. The two handsome homes were, by no means, the builder’s last projects in the neighborhood. The extent of his activities are evident in an advertisement in the New-York Daily Tribune on February 1, 1851. He offered for sale “two three-story and attic brick houses fronting on Washington-square, corner of West Washington place and Macdougal-st. Also, the two Houses adjoining 3 and 5 West Washington-place will be sold low.” The ad promised “They are built in the best manner, under the superintendence of William W. Berwick, Esq. and have every possible modern convenience.” Berwick was offering the most desirable houses—those facing Washington Square--at $13,000—about $415,000 today. William Berwick, for some reason, eventually moved next door to No. 15. It was here, on Tuesday, November 18, 1856, that the 70-year old died and where his funeral was held three days later. The two inventions Emery had come up with that year were the “New Anti-Friction Cotton Press” (both for packing and compressing), and the useful “Hay, Cider, Cheese and Tobacco Press.” He especially was interested in Southern investors for these latest devices. A. H. Emery’s stay here would be relatively short-lived. By 1864 the Serrell family was in the house. William Indigo Serrell was studying at the Free Academy of the City of New York at the time. And by 1869 it had been purchased by James T. Derrickson. On July 8, 1871 the Real Estate Record and Builders’ Guide reported that Derrickson was updating the Washington Place house. Calling the 24-foot wide residence a “first-class dwelling,” it announced “one story with Mansard roof to be added.” The completed alteration gave the nearly 30-year old house a touch of cutting-edge residential design. Exactly one decade later Washington Place was renumbered and No. 17 became No. 78. It was not the only change to come to the block, however. While Washington Square remained an exclusive address; the side streets were less fortunate. The brick and brownstone houses that had been “first-class dwellings” were quickly being operated as boarding houses. The Greek Revival palmette motif of the stoop railings is repeated in the finials of the areaway ironwork (far right). The stumpy newels are a late Victorian addition. Since his forced retirement, John McCabe had spent much time at the nearby Milholland Club at No. 111 Clinton Place. 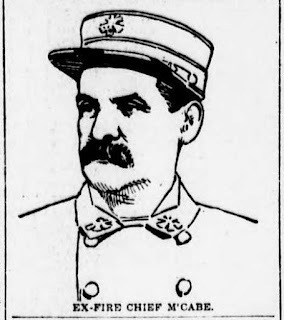 He became troubled in the spring of 1895 after being notified that was being called as a witness in the investigation by the Special Committee of the State Senate into corruption within the Fire Department. His testimony would require him to implicate good friends in illegal activities. They were the last words John McCabe would ever utter. He walked into a small room off the back of the main parlor and within moments Williamson heard a pistol shot. McCabe had put a bullet into his right temple. The now-widowed Jessie McCabe and 16-year old John McCabe, Jr. stayed on in the Washington Place house. Jessie continued to take in boarders, like Waldo H. Richardson who was Chairman of the Public Schools in 1898. She was determined that her son would succeed and by 1901 he was studying at Columbia University. After John McCabe received his medical degree, he opened his practice at No. 78 Washington Place. In 1911 a boarder died and the McCabes generously permitted the funeral of Barnard Brown to be held in the parlor on October 2. Only six months later it would be the scene of another funeral—that of Jessie McCabe. She died in her bedroom on March 20, 1912. In the 1920s Manhattan streets were still filled with impoverished young boys trying to earn money as bootblacks and newsboys. They were often homeless, living in charity-run lodging houses. And they definitely had nothing like toy automobiles. While its twin sister next door received an artist’s studio upper floor in the early 20th century; No. 78 is little changed since James Derrickson updated it in 1871. It survives as a wonderful piece of the tapestry that comprises the block and catalogs nearly two centuries of residential architecture.